A member of the genus Canis the coyote is related to the domestic dog. Their long, coarse fur is generally grizzled buff above and whitish undercoat with colors of gray, white, tan or brown with a black or white-tipped tail. Colors vary depending on where they live: darker coats live in the mountainous regions with lighter coats in the desert. Coyotes are known for their ability to adapt to any environment. They are omnivores—their willingness to moderate their diets from being meat eaters to eating fruits and nuts aids their adaptability. Their keen senses of smell, hearing and eye sight help them survive in close proximity to areas heavily populated by humans--they have been known to live in parks in major urban areas. Their range sprawls from Alaska to the U.S. northeast and into Central America. Coyotes den in burrows in hillsides and in thick undergrowth, where they give birth and raise their young. Coyotes are nocturnal hunting at night. They are extremely territorial and mark their domains with urine. They are poorly thought of by people that leave their pets outside at night, as they become prey for the hunting coyote. Known for howling at the moon, coyotes howl while hunting to communicate their locations to each other. Breeding season is February-March. Gestation is generally 63 days at which time the female gives birth to anywhere from three to 12 young in spring. The size of a litter is dependent upon where coyotes live. 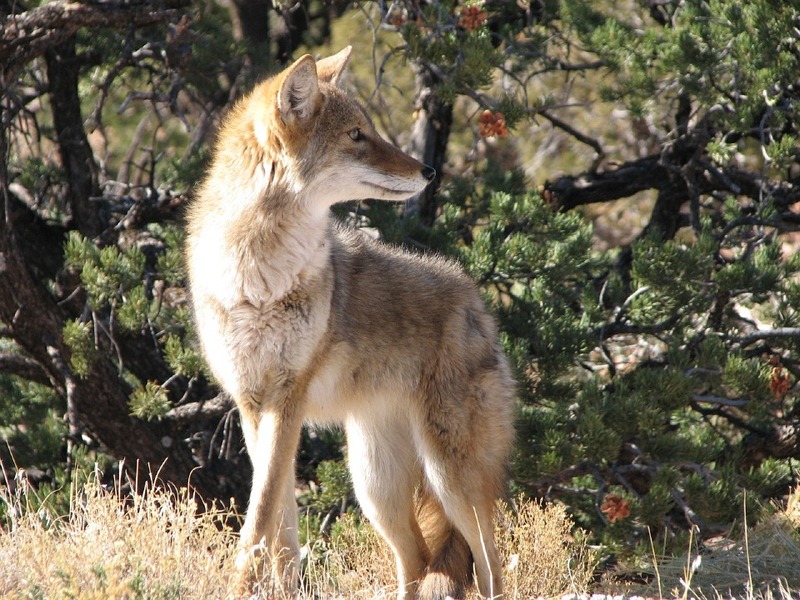 In areas where there are a lot of coyotes, the litters will be smaller, and vice versa. Abundance of food and density naturally regulate the coyote population. Both the male and female take care of the pups; the male bringing food to the female and pups and helps protect them from predators. Females will stay in the den with the pups until their eyes open—11 to 12 days. By fall the pups can hunt for themselves and are ready to mate within two years. Average life span of a coyote in the wild is 10 years. 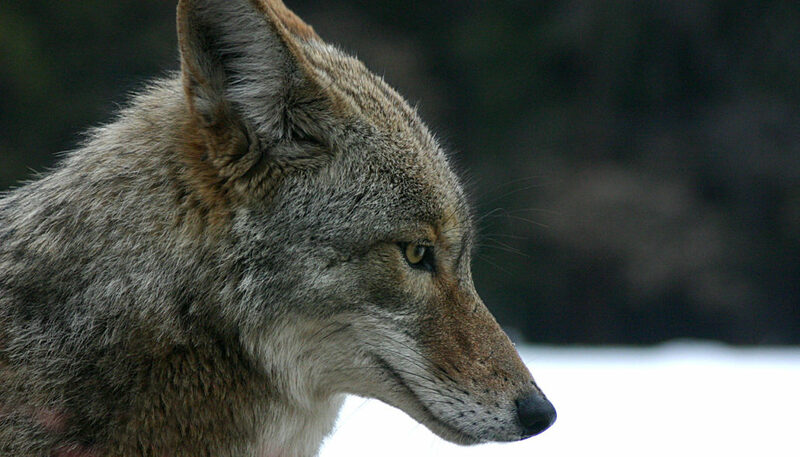 Coyotes can also mate with large dogs producing “coydogs.” The survival of this population is poor due to pups being born in the winter making it harder for them to survive. Also the males do not help with care of the pups, also causing poor survival rates. Tularemia which can be transmitted to other animals and to humans. 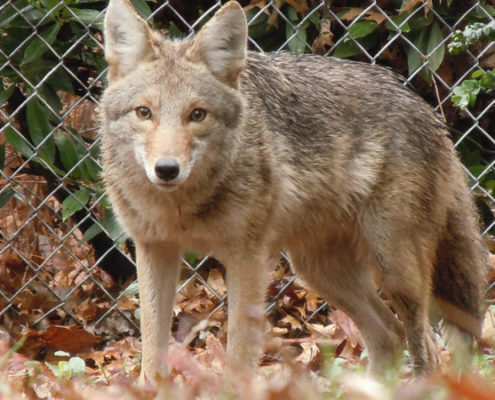 Some callers will be concerned coyotes that live on or near their property. While these animals can and will harm cats and small dogs, they generally will stay away from adult humans. People should always be cautious with wildlife, and sick wildlife sometimes will approach people. Young children should not be left outside alone, though the chances of a fox or coyote attacking them is slim. 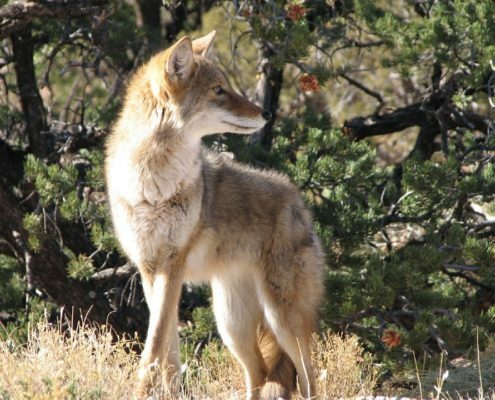 Feeding coyotes is discouraged as they will habituate and loose their natural aversion to humans, increasing the potential for human-coyote conflicts. Make sure the coyote is getting fed at the same time each night.Place the trap near the feeding area. Do not bait nor set it initially. Since you want to catch this injured guy quickly, keep the trap in place for at least 2 nights without baiting or setting it. On night 3, put food in the trap, a little further back than the entrance so the coyote will at least have to place a foot or two in the trap to get his food, but not far enough back where he would step on the mechanism to shut the door. Be sure to keep the door open with a bungee cord or rope, so it doesn't close on the coyote. Also, the food should be put in a paper bowl or something like that so it doesn't fall through the chain links. If this goes well, then go ahead and set the trap, with the food in its proper place for setting off the mechanism. Stand your ground. Make eye contact. Advance toward the coyote with your hazing tools if there is hesitation on the part of the coyote. Haze until the coyote retreats. Allow room for the coyote(s) to escape. 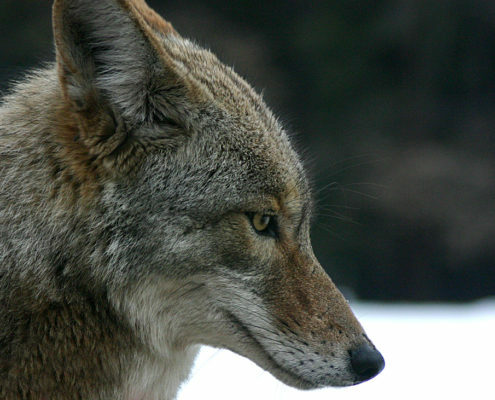 Make sure the coyote is focused on you as the source of danger or discomfort. Do not haze from buildings or your car where the coyote can’t see you clearly. Make it multisensory. Use tools that scare with sound, light & motion. Variety is essential. 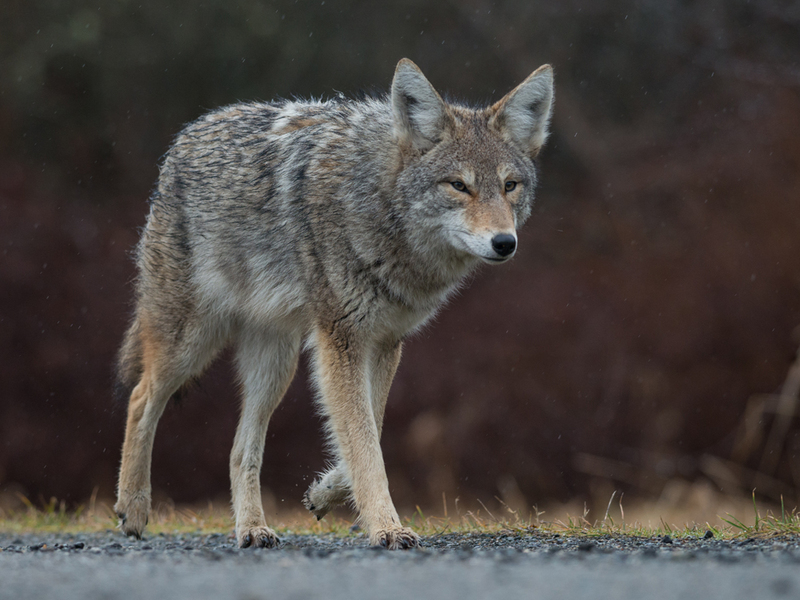 Coyotes can learn to recognize and avoid individual people, so the more often a coyote has a negative experience with various hazing tools and different people, the faster he will change his behavior to avoid human contact. Hazing should be exaggerated, assertive, and consistent. Communities should always maintain some level of hazing using a variety of tools so that coyotes do not return to unacceptable behavior over time. Coyotes have routine habits. Make note on when and where you encounter them. 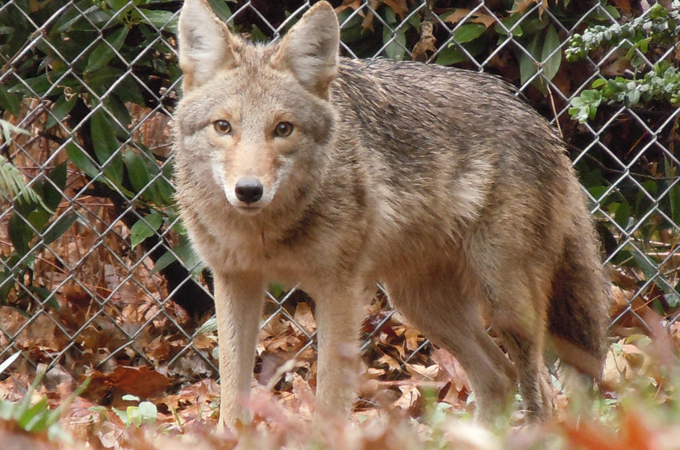 Ask neighbors in those areas to help you scare the coyote, or avoid those areas. Think prevention first! Coyote pups begin coming out of dens in the early summer and parents are very protective. Keep pets close and don’t let them roam. Freezing and staring at the hazer. Keep hazing and increasing the intensity of your efforts. Running/walking off a short distance, stopping, then looking back. The coyote is unsure if the hazing is directed at him. Keep hazing until he gets your message to leave. 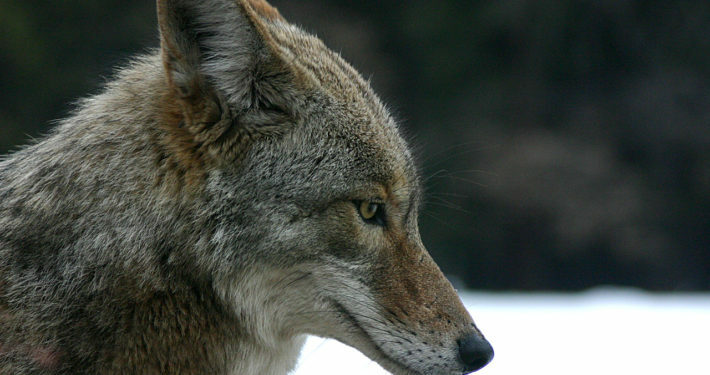 Living safely and comfortably with coyotes isn’t difficult. 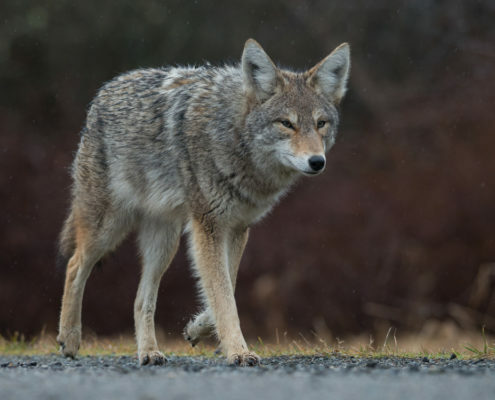 Removing attractants (and asking your neighbors to do the same), and knowing when and how to scare a coyote gives you an effective and non-lethal tool for comfortably coexisting with our urban wildlife. With this field guide in hand, you can take advantage of the many benefits that a coyote provides, including free and healthy rodent control. Coyotes can make good neighbors!